I’m here when my kids wake up in the morning. I’m the first person they see when they come downstairs. I take them for walks. We homeschool and play board games. I fold their little T-shirts from the dryer and set dinner before them every night. I tuck them in bed. Working from home doesn’t come without challenges. Get tips from @TriciaGoyer! This doesn’t come without challenges. With a six-year-old and two three-year-olds there is a lot of noise and a lot of mess. It’s sometimes hard to concentrate, and I’ve resorted to hiring outside help. I hire a housekeeper to come once a week. I hire a babysitter to come many times a week, during the day. I use Litfuse Publicity to be my extra hands and feet. They upload my blogs, manage my website, book guests for my radio show, etc. None of this has happened overnight. I’ve sought out help in small ways, and I’ve built up over time. I’ve taken each step once my income has been able to sustain it. And the truth is knowing that I have others counting on me paying them has helped me be diligent about my work, too. I can’t play around on Facebook or computer games all day. I need money coming in to support those who make it possible for me to do what I do. The one tool I depend on is my handy-dandy calendar. I use iCal on my Mac to keep track of where I need to be when. I don’t schedule anything unless I consult this first. I set up blocks when I knew the babysitter’s coming (or when my wonderful husband will have the kids), and then I schedule my work into those slots. Things don’t always go as planned, but at least I have a plan that propels me in the right direction! Not every slot is full. There is time to homeschool, to cook, to clean, to play outside. I schedule in time with friends. That large purple section in the afternoon on Friday was actually a phone call with a friend/fellow writer. We chatted for hours as the kids played. It filled me up! I focus on a few important things. My life revolves around my kids, my writing, friends/church, and mentoring teen moms. That’s enough. I say no to a lot of things so I can say yes to the things that God has called me to. The things most important to me. Whenever I start feeling anxious or worried, I go back to Ecclesiastes 4:6, “Better one handful with tranquillity than two handfuls with toil and chasing after the wind.” Yes, there are many additional ways I can give and serve, but one handful is enough, thank you very much. How about you? Do you have a calendar that helps you keep track of your life and goals? I’d love to hear about it! What tips do you have for WAHMs to stay organized? Share with @TriciaGoyer! You are in control of your calendar. You choose what to add in or take off. 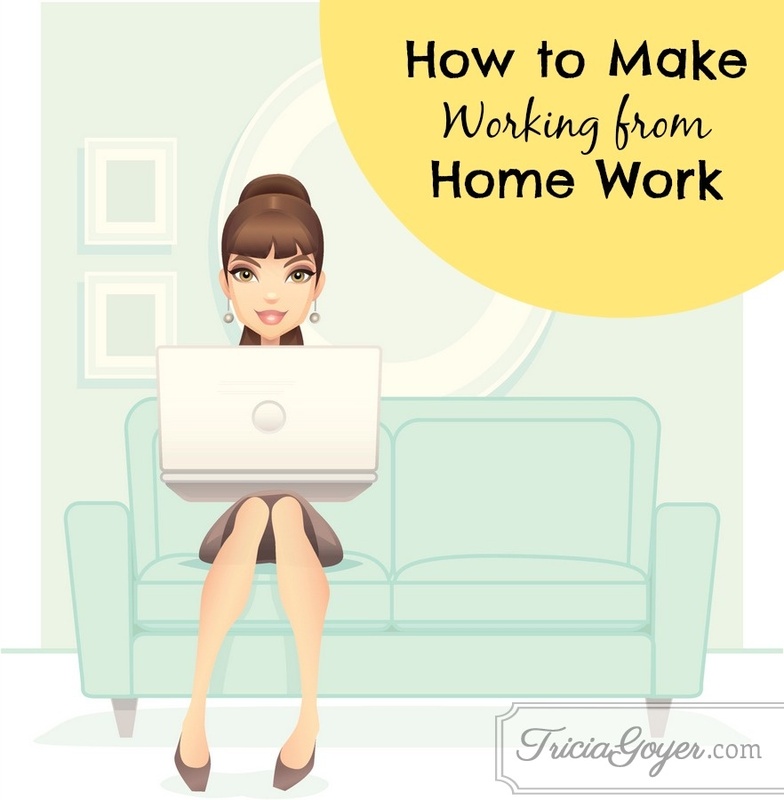 Making a plan is the first step to having a successful work-at-home week! Start small. If you’re going to hire help, do so in small chunks. Take on what you can sustain. Dear Lord, I thank you that you have given me the desire and the potential to make my work matter. I thank you that I’m also able to be home and love and support my family. I can only take steps to success with You leading and guiding. Please lead me today. I’m not sure what’s up with inlinkz. I tried several times to add my link and it’s there but it looks like it did something funny to the other links that had been added. This post is very inspiring! I have been struggling lately with finding balance. Specifically as a mom and a writer. We started homeschooling a year and a half ago and that has been an adjustment as well. One that I LOVE, but an adjustment none the less. I am finding it difficult to be CONSISTENT in my writing schedule now that my children are home (I previously wrote while they were in public school). They are older, but need guidance and motivation with their school work. We aren’t to the point where they work as independently as I’d like them to. I prefer a hands on calendar, so I decided to schedule my fiction writing and blog writing on my HS calendar so it becomes part of my day. Thank you for your encouraging example! What a great post!!! I don’t think I had ever really thought about that verse in Ecclesiastes. The Lord has been working on that principle in my heart for years now so thanks for sharing that verse. I also need to get on the whole calendar thing. 🙂 Being more organized would sure help me out a lot. I’m more organized than I used to be but even more so would help. Though I am already a blogger, I would really like to be a freelance writer. I think seeing your calendar helped me to understand the importance of focused time. With that said, I must close the computer and go fold three loads of laundry before preschool pick-up! I added my link a day late, but this was a fun one for me- I got to tell the story of my surprise dishwasher! Felt like Chapter 2 was written just for me. I’m a day behind (life happens) but am certainly being challenged. Thank you. There is no such thing as “behind.” God has a perfect plan for YOU!!! Hugs! Hi Tricia. My work from home job just closed. My income really helped. Please keep my family in prayer as I search for something new. Thanks for your tips.